Visionary-couple Wayne Adams (66) and Catherine King (59) built their first floating home together back in 1992 right off the coast of Vancouver Island in British Columbia. 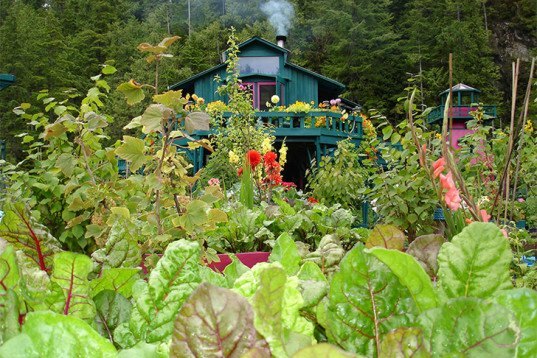 But the wish to create a more sustainable living grew together with their floating dream. Today, their floating island, the 'Freedom Cove', consists of 12 platforms complete with greenhouses, a dance floor, an art gallery, a lighthouse tower for guests, its own generator and a studio where the creative couple live. Adams and King have been living in their own self-made floating island since 1992. They are both artists, Adams is a carver and King, a retired ballerina enjoys painting, writing and playing music. Although they live on an island, the water comes from a nearby waterfall during the summer, and its collected from the sky during the winter. Related: CHUG: A Floating Community That Grows Their Own Vegetables in the Heart of London! The dynamic duo fish for food and grow their own vegetables in their half an acre garden, which contains a five greenhouses. The whole island used to be powered by an array of 14 solar panels that recently broke, so they had to switch to a generator for their power. ‘Freedom Cove’ welcomes visitors during the summer, so they can see and experience how the couple built and live their own sustainable life, more info here. "BOTH ARE CARVERS THAT WORK WITH IVORY" (go to 6:45 in the video) - yeah NICE SUSTAINABLE profession there... why is the article presenting totally different facts?? Visionary-couple Wayne Adams (66) and Catherine King (59) built their first floating home together back in 1992 right off the coast of Vancouver Island in British Columbia. But the wish to create a more sustainable living grew together with their dream. 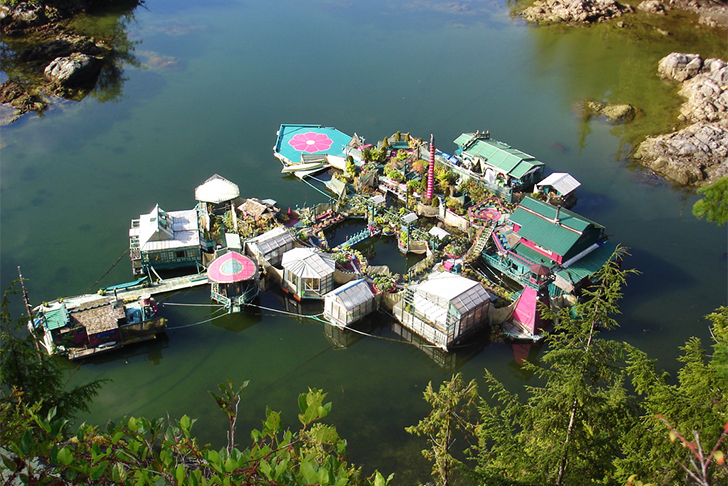 Adams and King have been living in their own self-made floating island since 1992. They are both artists, Adams is a carver and King, a retired ballerina enjoys painting, writing and playing music. Although they live on an island, the water comes from a nearby waterfall during the summer, and its collected from the sky during the winter. The dynamic duo fish for food and grow their own vegetables in their half an acre garden, which contains a five greenhouses. The whole island used to be powered by an array of 14 solar panels that recently broke, so they had to switch to a generator for their power. 'Freedom Cove' welcomes visitors during the summer, so they can see and experience how the couple built and live their own sustainable life.